These highlights do not include all the information needed to use ABILIFY safely and effectively. See full prescribing information for ABILIFY. Strong CYP3A4 (eg, ketoconazole) or CYP2D6 (eg, fluoxetine) inhibitors will increase ABILIFY drug concentrations; reduce ABILIFY dose to one-half of the usual dose when used concomitantly (2.6, 7.1), except when used as adjunctive treatment with antidepressants (2.6). If a strong CYP3A4 inhibitor and strong CYP2D6 inhibitor are co-administered or a known CYP2D6 poor metabolizer is receiving a concomitant strong CYP3A4 inhibitor, the ABILIFY dose should be reduced to one-quarter (25%) of the usual dose (2.6, 12.3). ABILIFY is indicated for the acute treatment of manic and mixed episodes associated with bipolar I disorder, both as monotherapy and as an adjunct to lithium or valproate. Efficacy as monotherapy was established in four 3-week monotherapy trials in adults and one 4-week monotherapy trial in pediatric patients (10 to 17 years). Efficacy as adjunctive therapy was established in one 6-week adjunctive trial in adults [see CLINICAL STUDIES (14.2)]. ABILIFY is indicated for the maintenance treatment of bipolar I disorder, both as monotherapy and as an adjunct to either lithium or valproate. Maintenance efficacy was demonstrated in one monotherapy maintenance trial and in one adjunctive maintenance trial in adults [see CLINICAL STUDIES (14.2)]. ABILIFY Injection is indicated for the acute treatment of agitation associated with schizophrenia or bipolar disorder, manic or mixed. â€œPsychomotor agitationâ€ is defined in DSM-IV as â€œexcessive motor activity associated with a feeling of inner tensionâ€. Patients experiencing agitation often manifest behaviors that interfere with their diagnosis and care (eg, threatening behaviors, escalating or urgently distressing behavior, or self-exhausting behavior), leading clinicians to the use of intramuscular antipsychotic medications to achieve immediate control of the agitation. Efficacy was established in three short-term (24-hour) trials in adults [see CLINICAL STUDIES (14.5)]. Adults: The recommended starting dose in adults is 15 mg given once daily as monotherapy and 10 mg to 15 mg given once daily as adjunctive therapy with lithium or valproate. ABILIFY can be given without regard to meals. The recommended target dose of ABILIFY is 15 mg/day, as monotherapy or as adjunctive therapy with lithium or valproate. The dose may be increased to 30 mg/day based on clinical response. The safety of doses above 30 mg/day has not been evaluated in clinical trials. Pediatrics: The recommended starting dose in pediatric patients (10 to 17 years) as monotherapy is 2 mg/day, with titration to 5 mg/day after 2 days, and a target dose of 10 mg/day after 2 additional days. Recommended dosing as adjunctive therapy to lithium or valproate is the same. Subsequent dose increases, if needed, should be administered in 5 mg/day increments. ABILIFY can be given without regard to meals [see CLINICAL STUDIES (14.2)]. The recommended dose for maintenance treatment, whether as monotherapy or as adjunctive therapy, is the same dose needed to stabilize patients during acute treatment, both for adult and pediatric patients. Patients should be periodically reassessed to determine the continued need for maintenance treatment [see CLINICAL STUDIES (14.2)]. Dosage adjustments in adults are not routinely indicated on the basis of age, gender, race, or renal or hepatic impairment status [see USE IN SPECIFIC POPULATIONS (8.4-8.10)]. • Dosage adjustment for patients taking aripiprazole concomitantly with strong CYP3A4 inhibitors: When concomitant administration of aripiprazole with strong CYP3A4 inhibitors such as ketoconazole or clarithromycin is indicated, the aripiprazole dose should be reduced to one-half of the usual dose. When the CYP3A4 inhibitor is withdrawn from the combination therapy, the aripiprazole dose should then be increased [see DRUG INTERACTIONS (7.1)]. • Dosage adjustment for patients taking aripiprazole concomitantly with potential CYP2D6 inhibitors: When concomitant administration of potential CYP2D6 inhibitors such as quinidine, fluoxetine, or paroxetine with aripiprazole occurs, aripiprazole dose should be reduced at least to one-half of its normal dose. When the CYP2D6 inhibitor is withdrawn from the combination therapy, the aripiprazole dose should then be increased [see DRUG INTERACTIONS (7.1)]. When adjunctive ABILIFY is administered to patients with major depressive disorder, ABILIFY should be administered without dosage adjustment as specified in DOSAGE AND ADMINISTRATION (2.3). • Dosing recommendation in patients taking aripiprazole concomitantly with strong CYP3A4 and CYP2D6 inhibitors: When concomitant administration of aripiprazole with strong inhibitors of CYP3A4 (such as ketoconazole or clarithromycin) and CYP2D6 (such as quinidine, fluoxetine, or paroxetine) is indicated, the aripiprazole dose should be reduced to one-quarter (25%) of the usual dose. When the CYP3A4 and/or CYP2D6 inhibitor is withdrawn from the combination therapy, the aripiprazole dose should be increased [see DRUG INTERACTIONS (7.1)]. • Dosing recommendation in patients taking aripiprazole concomitantly with strong, moderate, or weak inhibitors of CYP3A4 and CYP2D6: Patients who may be receiving a combination of strong, moderate, and weak inhibitors of CYP3A4 and CYP2D6 (eg, a potent CYP3A4 inhibitor and a moderate CYP2D6 inhibitor or a moderate CYP3A4 inhibitor with a moderate CYP2D6 inhibitor), the dosing may be reduced to one-quarter (25%) of the usual dose initially and then adjusted to achieve a favorable clinical response. • Dosing recommendation in patients who are classified as CYP2D6 poor metabolizers (PM): The aripiprazole dose in PM patients should initially be reduced to one-half (50%) of the usual dose and then adjusted to achieve a favorable clinical response. The dose of aripiprazole for PM patients who are administered a strong CYP3A4 inhibitor should be reduced to one-quarter (25%) of the usual dose [see CLINICAL PHARMACOLOGY (12.3)]. • Dosage adjustment for patients taking potential CYP3A4 inducers: When a potential CYP3A4 inducer such as carbamazepine is added to aripiprazole therapy, the aripiprazole dose should be doubled. Additional dose increases should be based on clinical evaluation. When the CYP3A4 inducer is withdrawn from the combination therapy, the aripiprazole dose should be reduced to 10 mg to 15 mg [see DRUG INTERACTIONS (7.1)]. In three, 10-week, placebo-controlled studies of aripiprazole in elderly patients with psychosis associated with Alzheimerâ€™s disease (n=938; mean age: 82.4 years; range: 56-99 years), the treatment-emergent adverse events that were reported at an incidence of â‰¥3% and aripiprazole incidence at least twice that for placebo were lethargy [placebo 2%, aripiprazole 5%], somnolence (including sedation) [placebo 3%, aripiprazole 8%], and incontinence (primarily, urinary incontinence) [placebo 1%, aripiprazole 5%], excessive salivation [placebo 0%, aripiprazole 4%], and lightheadedness [placebo 1%, aripiprazole 4%]. Aripiprazole may cause orthostatic hypotension, perhaps due to its Î±1-adrenergic receptor antagonism. The incidence of orthostatic hypotension-associated events from short-term, placebo-controlled trials of adult patients on oral ABILIFY (n=2467) included (aripiprazole incidence, placebo incidence) orthostatic hypotension (1%, 0.3%), postural dizziness (0.5%, 0.3%), and syncope (0.5%, 0.4%); of pediatric patients 6 to 17 years of age (n=611) on oral ABILIFY included orthostatic hypotension (0.5%, 0%), postural dizziness (0.3%, 0%), and syncope (0.2%, 0%); and of patients on ABILIFY Injection (n=501) included orthostatic hypotension (0.6%, 0%), postural dizziness (0.2%, 0.5%), and syncope (0.4%, 0%). The incidence of a significant orthostatic change in blood pressure (defined as a decrease in systolic blood pressure â‰¥20 mmHg accompanied by an increase in heart rate â‰¥25 when comparing standing to supine values) for aripiprazole was not meaningfully different from placebo (aripiprazole incidence, placebo incidence): in adult oral aripiprazole-treated patients (4%, 2%), in pediatric oral aripiprazole-treated patients aged 6 to 17 years (0.2%, 1%), or in aripiprazole injection-treated patients (3%, 2%). Class Effect: In clinical trial and/or postmarketing experience, events of leukopenia/neutropenia have been reported temporally related to antipsychotic agents, including ABILIFY. Agranulocytosis has also been reported. Possible risk factors for leukopenia/neutropenia include pre-existing low white blood cell count (WBC) and history of drug-induced leukopenia/neutropenia. Patients with a history of a clinically significant low WBC or drug-induced leukopenia/neutropenia should have their complete blood count (CBC) monitored frequently during the first few months of therapy and discontinuation of ABILIFY should be considered at the first sign of a clinically significant decline in WBC in the absence of other causative factors. Patients with clinically significant neutropenia should be carefully monitored for fever or other symptoms or signs of infection and treated promptly if such symptoms or signs occur. Patients with severe neutropenia (absolute neutrophil count <1000/mm3) should discontinue ABILIFY and have their WBC followed until recovery. As with other antipsychotic drugs, aripiprazole should be used cautiously in patients with a history of seizures or with conditions that lower the seizure threshold, eg, Alzheimerâ€™s dementia. Conditions that lower the seizure threshold may be more prevalent in a population of 65 years or older. Disruption of the bodyâ€™s ability to reduce core body temperature has been attributed to antipsychotic agents. Appropriate care is advised when prescribing aripiprazole for patients who will be experiencing conditions which may contribute to an elevation in core body temperature, (eg, exercising strenuously, exposure to extreme heat, receiving concomitant medication with anticholinergic activity, or being subject to dehydration) [see ADVERSE REACTIONS (6.3)]. In two 6-week, placebo-controlled studies of aripiprazole as adjunctive treatment of major depressive disorder, the incidences of suicidal ideation and suicide attempts were 0% (0/371) for aripiprazole and 0.5% (2/366) for placebo. Esophageal dysmotility and aspiration have been associated with antipsychotic drug use, including ABILIFY. Aspiration pneumonia is a common cause of morbidity and mortality in elderly patients, in particular those with advanced Alzheimerâ€™s dementia. Aripiprazole and other antipsychotic drugs should be used cautiously in patients at risk for aspiration pneumonia [see WARNINGS AND PRECAUTIONS (5.1) and ADVERSE REACTIONS (6.3)]. The most common adverse reactions in adult patients in clinical trials (â‰¥10%) were nausea, vomiting, constipation, headache, dizziness, akathisia, anxiety, insomnia, and restlessness. The most common adverse reactions in the pediatric clinical trials (â‰¥10%) were somnolence, headache, vomiting, extrapyramidal disorder, fatigue, increased appetite, insomnia, nausea, nasopharyngitis, and weight increased. Aripiprazole has been evaluated for safety in 13,543 adult patients who participated in multiple-dose, clinical trials in schizophrenia, bipolar disorder, major depressive disorder, Dementia of the Alzheimerâ€™s type, Parkinsonâ€™s disease, and alcoholism, and who had approximately 7619 patient-years of exposure to oral aripiprazole and 749 patients with exposure to aripiprazole injection. A total of 3390 patients were treated with oral aripiprazole for at least 180 days and 1933 patients treated with oral aripiprazole had at least 1 year of exposure. Table 6 enumerates the pooled incidence, rounded to the nearest percent, of adverse reactions that occurred during acute therapy (up to 6 weeks in schizophrenia and up to 3 weeks in bipolar mania), including only those reactions that occurred in 2% or more of patients treated with aripiprazole (doses â‰¥2 mg/day) and for which the incidence in patients treated with aripiprazole was greater than the incidence in patients treated with placebo in the combined dataset. The following findings are based on one 6-week, placebo-controlled trial in which oral aripiprazole was administered in doses ranging from 2 mg/day to 30 mg/day. The following findings are based on one 4-week, placebo-controlled trial in which oral aripiprazole was administered in doses of 10 mg/day or 30 mg/day. Table 10 enumerates the pooled incidence, rounded to the nearest percent, of adverse reactions that occurred during acute therapy (up to 6 weeks in schizophrenia, up to 4 weeks in bipolar mania, and up to 8 weeks in autistic disorder), including only those reactions that occurred in 1% or more of pediatric patients treated with aripiprazole (doses â‰¥2 mg/day) and for which the incidence in patients treated with aripiprazole was greater than the incidence in patients treated with placebo. Table 11 enumerates the pooled incidence, rounded to the nearest percent, of adverse reactions that occurred during acute therapy (up to 6 weeks), including only those adverse reactions that occurred in 2% or more of patients treated with adjunctive aripiprazole (doses â‰¥2 mg/day) and for which the incidence in patients treated with adjunctive aripiprazole was greater than the incidence in patients treated with adjunctive placebo in the combined dataset. Table 12 enumerates the pooled incidence, rounded to the nearest percent, of adverse reactions that occurred during acute therapy (24-hour), including only those adverse reactions that occurred in 2% or more of patients treated with aripiprazole injection (doses â‰¥5.25 mg/day) and for which the incidence in patients treated with aripiprazole injection was greater than the incidence in patients treated with placebo in the combined dataset. Objectively collected data from those trials was collected on the Simpson Angus Rating Scale (for EPS), the Barnes Akathisia Scale (for akathisia), and the Assessments of Involuntary Movement Scales (for dyskinesias). In the adult schizophrenia trials, the objectively collected data did not show a difference between aripiprazole and placebo, with the exception of the Barnes Akathisia Scale (aripiprazole, 0.08; placebo, âˆ’0.05). In the pediatric (13 to 17 years) schizophrenia trial, the objectively collected data did not show a difference between aripiprazole and placebo, with the exception of the Simpson Angus Rating Scale (aripiprazole, 0.24; placebo, âˆ’0.29). In the adult bipolar mania trials with monotherapy aripiprazole, the Simpson Angus Rating Scale and the Barnes Akathisia Scale showed a significant difference between aripiprazole and placebo (aripiprazole, 0.50; placebo, âˆ’0.01 and aripiprazole, 0.21; placebo, âˆ’0.05). Changes in the Assessments of Involuntary Movement Scales were similar for the aripiprazole and placebo groups. In the bipolar mania trials with aripiprazole as adjunctive therapy with either lithium or valproate, the Simpson Angus Rating Scale and the Barnes Akathisia Scale showed a significant difference between adjunctive aripiprazole and adjunctive placebo (aripiprazole, 0.73; placebo, 0.07 and aripiprazole, 0.30; placebo, 0.11). Changes in the Assessments of Involuntary Movement Scales were similar for adjunctive aripiprazole and adjunctive placebo. In the pediatric (10 to 17 years) short-term bipolar mania trial, the Simpson Angus Rating Scale showed a significant difference between aripiprazole and placebo (aripiprazole, 0.90; placebo, âˆ’0.05). Changes in the Barnes Akathisia Scale and the Assessments of Involuntary Movement Scales were similar for the aripiprazole and placebo groups. In the pediatric (6 to 17 years) short-term autistic disorder trials, the Simpson Angus Rating Scale showed a significant difference between aripiprazole and placebo (aripiprazole, 0.1; placebo, âˆ’0.4). Changes in the Barnes Akathisia Scale and the Assessments of Involuntary Movement Scales were similar for the aripiprazole and placebo groups. In a long-term (26-week), placebo-controlled trial in schizophrenia, there were no medically important differences between the aripiprazole and placebo patients in the mean change from baseline in prolactin, fasting glucose, triglyceride, HDL, LDL, or total cholesterol measurements. A similar profile was observed in long-term clinical trials of patients with bipolar disorder. In 4-week to 6- week trials in adults with schizophrenia, there was a slight difference in mean weight gain between aripiprazole and placebo patients (+0.7 kg vs. âˆ’0.05 kg, respectively) and also a difference in the proportion of patients meeting a weight gain criterion of â‰¥7% of body weight [aripiprazole (8%) compared to placebo (3%)]. In a 6-week trial in pediatric patients (13 to 17 years) with schizophrenia, there was a slight difference in mean weight gain between aripiprazole and placebo patients (+0.13 kg vs. âˆ’0.83 kg, respectively) and also a difference in the proportion of patients meeting a weight gain criterion of â‰¥7% of body weight [aripiprazole (5%) compared to placebo (1%)]. In 3-week trials in adults with mania with monotherapy aripiprazole, the mean weight gain for aripiprazole and placebo patients was 0.1 kg vs. 0.0 kg, respectively. The proportion of patients meeting a weight gain criterion of â‰¥7% of body weight was aripiprazole (2%) compared to placebo (3%). In the 6-week trial in mania with aripiprazole as adjunctive therapy with either lithium or valproate, the mean weight gain for aripiprazole and placebo patients was 0.6 kg vs. 0.2 kg, respectively. The proportion of patients meeting a weight gain criterion of â‰¥7% of body weight with adjunctive aripiprazole was 3% compared to adjunctive placebo 4%. In the trials adding aripiprazole to antidepressants, patients first received 8 weeks of antidepressant treatment followed by 6 weeks of adjunctive aripiprazole or placebo in addition to their ongoing antidepressant treatment. 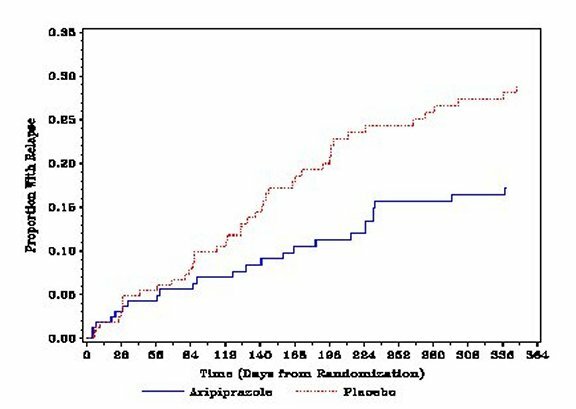 The mean weight gain with adjunctive aripiprazole was 1.7 kg vs. 0.4 kg with adjunctive placebo. The proportion of patients meeting a weight gain criterion of â‰¥7% of body weight was 5% with adjunctive aripiprazole compared to 1% with adjunctive placebo. In the two short-term, placebo-controlled trials in patients (6 to 17 years) with autistic disorder, the mean increase in body weight in the aripiprazole group was 1.6 kg vs. 0.4 kg in the placebo group. The proportion of patients meeting a weight gain criterion of â‰¥7% of body weight was 26% in aripiprazole group compared to 7% in placebo group. Table 13 provides the weight change results from a long-term (26-week), placebo-controlled study of aripiprazole in adults with schizophrenia, both mean change from baseline and proportions of patients meeting a weight gain criterion of â‰¥7% of body weight relative to baseline, categorized by BMI at baseline. Although there was no mean weight increase, the aripiprazole group tended to show more patients with a â‰¥7% weight gain. The adverse reactions reported in a 26-week, double-blind trial comparing oral ABILIFY and placebo in patients with schizophrenia were generally consistent with those reported in the short-term, placebo-controlled trials, except for a higher incidence of tremor [8% (12/153) for ABILIFY vs. 2% (3/153) for placebo]. In this study, the majority of the cases of tremor were of mild intensity (8/12 mild and 4/12 moderate), occurred early in therapy (9/12 â‰¤49 days), and were of limited duration (7/12 â‰¤10 days). Tremor infrequently led to discontinuation (<1%) of ABILIFY. In addition, in a long-term (52-week), active-controlled study, the incidence of tremor was 5% (40/859) for ABILIFY. A similar profile was observed in a long-term monotherapy study and a long-term adjunctive study with lithium and valproate in bipolar disorder. Following is a list of MedDRA terms that reflect adverse reactions as defined in ADVERSE REACTIONS (6.1) reported by patients treated with oral aripiprazole at multiple doses â‰¥2 mg/day during any phase of a trial within the database of 13,543 adult patients. All events assessed as possible adverse drug reactions have been included with the exception of more commonly occurring events. In addition, medically/clinically meaningful adverse reactions, particularly those that are likely to be useful to the prescriber or that have pharmacologic plausibility, have been included. Events already listed in other parts of ADVERSE REACTIONS (6), or those considered in WARNINGS AND PRECAUTIONS (5) or OVERDOSAGE (10) have been excluded. Although the reactions reported occurred during treatment with aripiprazole, they were not necessarily caused by it. Aripiprazole at doses of 10 mg/day to 30 mg/day for 14 days had no effect on dextromethorphanâ€™s O-dealkylation to its major metabolite, dextrorphan, a pathway dependent on CYP2D6 activity. Aripiprazole also had no effect on dextromethorphanâ€™s N-demethylation to its metabolite 3-methoxymorphinan, a pathway dependent on CYP3A4 activity. No dosage adjustment of dextromethorphan is required when administered concomitantly with aripiprazole. In general, no dosage adjustment for ABILIFY is required on the basis of a patientâ€™s age, gender, race, smoking status, hepatic function, or renal function [see DOSAGE AND ADMINISTRATION (2.5)]. There are no adequate and well-controlled studies in pregnant women. It is not known whether aripiprazole can cause fetal harm when administered to a pregnant woman or can affect reproductive capacity. Neonates exposed to antipsychotic drugs during the third trimester of pregnancy are at risk for extrapyramidal and/or withdrawal symptoms following delivery. There have been reports of agitation, hypertonia, hypotonia, tremor, somnolence, respiratory distress and feeding disorder in these neonates. These complications have varied in severity; while in some cases symptoms have been self-limited, in other cases neonates have required intensive care unit support and prolonged hospitalization. Aripiprazole should be used during pregnancy only if the potential benefit justifies the potential risk to the fetus. Safety and effectiveness in pediatric patients demonstrating irritability associated with autistic disorder were established in two 8-week, placebo-controlled clinical trials in 212 pediatric patients aged 6 to 17 years [see INDICATIONS AND USAGE (1.4), DOSAGE AND ADMINISTRATION (2.4), ADVERSE REACTIONS (6.2), and CLINICAL STUDIES (14.4)]. Maintenance efficacy in pediatric patients has not been systematically evaluated. In formal single-dose pharmacokinetic studies (with aripiprazole given in a single dose of 15 mg), aripiprazole clearance was 20% lower in elderly (â‰¥65 years) subjects compared to younger adult subjects (18 to 64 years). There was no detectable age effect, however, in the population pharmacokinetic analysis in schizophrenia patients. Also, the pharmacokinetics of aripiprazole after multiple doses in elderly patients appeared similar to that observed in young, healthy subjects. No dosage adjustment is recommended for elderly patients [see also BOXED WARNING and WARNINGS AND PRECAUTIONS (5.1)]. Of the 13,543 patients treated with oral aripiprazole in clinical trials, 1073 (8%) were â‰¥65 years old and 799 (6%) were â‰¥75 years old. The majority (81%) of the 1073 patients were diagnosed with Dementia of the Alzheimerâ€™s type. Of the 749 patients treated with aripiprazole injection in clinical trials, 99 (13%) were â‰¥65 years old and 78 (10%) were â‰¥75 years old. Placebo-controlled studies of aripiprazole injection in patients with agitation associated with schizophrenia or bipolar mania did not include sufficient numbers of subjects aged 65 and over to determine whether they respond differently from younger subjects. Studies of elderly patients with psychosis associated with Alzheimerâ€™s disease have suggested that there may be a different tolerability profile in this population compared to younger patients with schizophrenia [see also BOXED WARNING and WARNINGS AND PRECAUTIONS (5.1)]. The safety and efficacy of ABILIFY in the treatment of patients with psychosis associated with Alzheimerâ€™s disease has not been established. If the prescriber elects to treat such patients with ABILIFY, vigilance should be exercised. In patients with severe renal impairment (creatinine clearance <30 mL/min), Cmax of aripiprazole (given in a single dose of 15 mg) and dehydro-aripiprazole increased by 36% and 53%, respectively, but AUC was 15% lower for aripiprazole and 7% higher for dehydro-aripiprazole. Renal excretion of both unchanged aripiprazole and dehydro-aripiprazole is less than 1% of the dose. No dosage adjustment is required in subjects with renal impairment. ABILIFY DISCMELT Orally Disintegrating Tablets are available in 10 mg and 15 mg strengths. Inactive ingredients include acesulfame potassium, aspartame, calcium silicate, croscarmellose sodium, crospovidone, crème de vanilla (natural and artificial flavors), magnesium stearate, microcrystalline cellulose, silicon dioxide, tartaric acid, and xylitol. Colorants include ferric oxide (yellow or red) and FD&C Blue No. 2 Aluminum Lake. ABILIFY Injection is available in single-dose vials as a ready-to-use, 9.75 mg/1.3 mL (7.5 mg/mL) clear, colorless, sterile, aqueous solution for intramuscular use only. Inactive ingredients for this solution include 150 mg/mL of sulfobutylether Î²-cyclodextrin (SBECD), tartaric acid, sodium hydroxide, and water for injection. Approximately 8% of Caucasians and 3â€“8% of Black/African Americans lack the capacity to metabolize CYP2D6 substrates and are classified as poor metabolizers (PM), whereas the rest are extensive metabolizers (EM). PMs have about an 80% increase in aripiprazole exposure and about a 30% decrease in exposure to the active metabolite compared to EMs, resulting in about a 60% higher exposure to the total active moieties from a given dose of aripiprazole compared to EMs. Coadministration of ABILIFY with known inhibitors of CYP2D6, such as quinidine or fluoxetine in EMs, approximately doubles aripiprazole plasma exposure, and dose adjustment is needed [see DRUG INTERACTIONS (7.1)]. Similarly, PMs have higher exposure to aripiprazole compared to EMs; hence, PMs should have their initial dose reduced by one-half. Laboratory tests are available to identify CYP2D6 PMs. The mean elimination half-lives are about 75 hours and 146 hours for aripiprazole in EMs and PMs, respectively. Aripiprazole does not inhibit or induce the CYP2D6 pathway. The efficacy of ABILIFY in the treatment of schizophrenia was evaluated in five short-term (4-week and 6-week), placebo-controlled trials of acutely relapsed inpatients who predominantly met DSM-III/IV criteria for schizophrenia. Four of the five trials were able to distinguish aripiprazole from placebo, but one study, the smallest, did not. Three of these studies also included an active control group consisting of either risperidone (one trial) or haloperidol (two trials), but they were not designed to allow for a comparison of ABILIFY and the active comparators. • In a 4-week trial (n=414) comparing two fixed doses of ABILIFY (15 mg/day or 30 mg/day) to placebo, both doses of ABILIFY were superior to placebo in the PANSS total score, PANSS positive subscale, and CGI-severity score. In addition, the 15 mg dose was superior to placebo in the PANSS negative subscale. • In a 4-week trial (n=404) comparing two fixed doses of ABILIFY (20 mg/day or 30 mg/day) to placebo, both doses of ABILIFY were superior to placebo in the PANSS total score, PANSS positive subscale, PANSS negative subscale, and CGI-severity score. • In a 6-week trial (n=420) comparing three fixed doses of ABILIFY (10 mg/day, 15 mg/day, or 20 mg/day) to placebo, all three doses of ABILIFY were superior to placebo in the PANSS total score, PANSS positive subscale, and the PANSS negative subscale. • In a 6-week trial (n=367) comparing three fixed doses of ABILIFY (2 mg/day, 5 mg/day, or 10 mg/day) to placebo, the 10 mg dose of ABILIFY was superior to placebo in the PANSS total score, the primary outcome measure of the study. The 2 mg and 5 mg doses did not demonstrate superiority to placebo on the primary outcome measure. • In a fifth study, a 4-week trial (n=103) comparing ABILIFY in a range of 5 mg/day to 30 mg/day to placebo, ABILIFY was only significantly different compared to placebo in a responder analysis based on the CGI-severity score, a primary outcome for that trial. A longer-term trial enrolled 310 inpatients or outpatients meeting DSM-IV criteria for schizophrenia who were, by history, symptomatically stable on other antipsychotic medications for periods of 3 months or longer. These patients were discontinued from their antipsychotic medications and randomized to ABILIFY 15 mg/day or placebo for up to 26 weeks of observation for relapse. Relapse during the double-blind phase was defined as CGI-Improvement score of â‰¥5 (minimally worse), scores â‰¥5 (moderately severe) on the hostility or uncooperativeness items of the PANSS, or â‰¥20% increase in the PANSS total score. Patients receiving ABILIFY 15 mg/day experienced a significantly longer time to relapse over the subsequent 26 weeks compared to those receiving placebo. The efficacy of ABILIFY (aripiprazole) in the treatment of schizophrenia in pediatric patients (13 to 17 years of age) was evaluated in one 6-week, placebo-controlled trial of outpatients who met DSM-IV criteria for schizophrenia and had a PANSS score â‰¥70 at baseline. In this trial (n=302) comparing two fixed doses of ABILIFY (10 mg/day or 30 mg/day) to placebo, ABILIFY was titrated starting from 2 mg/day to the target dose in 5 days in the 10 mg/day treatment arm and in 11 days in the 30 mg/day treatment arm. Both doses of ABILIFY were superior to placebo in the PANSS total score, the primary outcome measure of the study. The 30 mg/day dosage was not shown to be more efficacious than the 10 mg/day dose. Although maintenance efficacy in pediatric patients has not been systematically evaluated, maintenance efficacy can be extrapolated from adult data along with comparisons of aripiprazole pharmacokinetic parameters in adult and pediatric patients. The efficacy of ABILIFY as monotherapy in the acute treatment of manic episodes was established in four 3-week, placebo-controlled trials in hospitalized patients who met the DSM-IV criteria for bipolar I disorder with manic or mixed episodes. These studies included patients with or without psychotic features and two of the studies also included patients with or without a rapid-cycling course. Patients were initiated on open-label lithium (0.6 mEq/L to 1.0 mEq/L) or valproate (50 Î¼g/mL to 125 Î¼g/mL) at therapeutic serum levels, and remained on stable doses for 2 weeks. At the end of 2 weeks, patients demonstrating inadequate response (Y-MRS total score â‰¥16 and â‰¤25% improvement on the Y-MRS total score) to lithium or valproate were randomized to receive either aripiprazole (15 mg/day or an increase to 30 mg/day as early as day 7) or placebo as adjunctive therapy with open-label lithium or valproate. In the 6-week, placebo-controlled phase, adjunctive ABILIFY starting at 15 mg/day with concomitant lithium or valproate (in a therapeutic range of 0.6 mEq/L to 1.0 mEq/L or 50 Î¼g/mL to 125 Î¼g/mL, respectively) was superior to lithium or valproate with adjunctive placebo in the reduction of the Y-MRS total score and CGI-BP Severity of Illness score (mania). Seventy-one percent of the patients coadministered valproate and 62% of the patients coadministered lithium were on 15 mg/day at 6-week endpoint. The efficacy of ABILIFY in the treatment of bipolar I disorder in pediatric patients (10 to 17 years of age) was evaluated in one four-week, placebo-controlled trial (n=296) of outpatients who met DSM-IV criteria for bipolar I disorder manic or mixed episodes with or without psychotic features and had a Y-MRS score â‰¥20 at baseline. This double-blind, placebo-controlled trial compared two fixed doses of ABILIFY (10 mg/day or 30 mg/day) to placebo. The ABILIFY dose was started at 2 mg/day, which was titrated to 5 mg/day after 2 days, and to the target dose in 5 days in the 10 mg/day treatment arm and in 13 days in the 30 mg/day treatment arm. Both doses of ABILIFY were superior to placebo in change from baseline to week 4 on the Y-MRS total score. A maintenance trial was conducted in adult patients meeting DSM-IV criteria for bipolar I disorder with a recent manic or mixed episode who had been stabilized on open-label ABILIFY and who had maintained a clinical response for at least 6 weeks. The first phase of this trial was an open-label stabilization period in which inpatients and outpatients were clinically stabilized and then maintained on open-label ABILIFY (15 mg/day or 30 mg/day, with a starting dose of 30 mg/day) for at least 6 consecutive weeks. One hundred sixty-one outpatients were then randomized in a double-blind fashion, to either the same dose of ABILIFY they were on at the end of the stabilization and maintenance period or placebo and were then monitored for manic or depressive relapse. During the randomization phase, ABILIFY was superior to placebo on time to the number of combined affective relapses (manic plus depressive), the primary outcome measure for this study. A total of 55 mood events were observed during the double-blind treatment phase. Nineteen were from the ABILIFY group and 36 were from the placebo group. The number of observed manic episodes in the ABILIFY group (6) were fewer than that in the placebo group (19), while the number of depressive episodes in the ABILIFY group (9) was similar to that in the placebo group (11). An adjunctive maintenance trial was conducted in adult patients meeting DSM-IV criteria for bipolar I disorder with a recent manic or mixed episode. Patients were initiated on open-label lithium (0.6 mEq/L to 1.0 mEq/L) or valproate (50 Î¼g/mL to 125 Î¼g/mL) at therapeutic serum levels, and remained on stable doses for 2 weeks. At the end of 2 weeks, patients demonstrating inadequate response (Y-MRS total score â‰¥16 and â‰¤35% improvement on the Y-MRS total score) to lithium or valproate received aripiprazole with a starting dose of 15 mg/day with the option to increase to 30 mg or reduce to 10 mg as early as day 4, as adjunctive therapy with open-label lithium or valproate. Prior to randomization, patients on the combination of single-blind aripiprazole and lithium or valproate were required to maintain stability (Y-MRS and MADRS total scores â‰¤12) for 12 consecutive weeks. Three hundred and thirty-seven patients were then randomized in a double-blind fashion, to either the same dose of ABILIFY they were on at the end of the stabilization period or placebo plus lithium or valproate and were then monitored for manic, mixed, or depressive relapse for a maximum of 52 weeks. ABILIFY was superior to placebo on the primary endpoint, time from randomization to relapse to any mood event. A mood event was defined as hospitalization for a manic, mixed or depressive episode, study discontinuation due to lack of efficacy accompanied by Y-MRS score >16 and/or a MADRS >16, or an SAE of worsening disease accompanied by Y-MRS score >16 and/or a MADRS >16. A total of 68 mood events were observed during the double-blind treatment phase. Twenty-five were from the ABILIFY group and 43 were from the placebo group. The number of observed manic episodes in the ABILIFY group (7) were fewer than that in the placebo group (19), while the number of depressive episodes in the ABILIFY group (14) was similar to that in the placebo group (18). The Kaplan-Meier curves of the time from randomization to relapse to any mood event during the 52-week double-blind treatment phase for ABILIFY and placebo groups are shown in Figure 1. • In one of the 8-week, placebo-controlled trials, children and adolescents with autistic disorder (n=98), aged 6 to 17 years, received daily doses of placebo or ABILIFY 2 mg/day to 15 mg/day. ABILIFY, starting at 2 mg/day with increases allowed up to 15 mg/day based on clinical response, significantly improved scores on the ABC-I subscale and on the CGI-I scale compared with placebo. The mean daily dose of ABILIFY at the end of 8-week treatment was 8.6 mg/day. • In the other 8-week, placebo-controlled trial in children and adolescents with autistic disorder (n=218), aged 6 to 17 years, three fixed doses of ABILIFY (5 mg/day, 10 mg/day, or 15 mg/day) were compared to placebo. ABILIFY dosing started at 2 mg/day and was increased to 5 mg/day after one week. After a second week, it was increased to 10 mg/day for patients in the 10 mg and 15 mg dose arms, and after a third week, it was increased to 15 mg/day in the 15 mg/day treatment arm. All three doses of ABILIFY significantly improved scores on the ABC-I subscale compared with placebo. • In a placebo-controlled trial in agitated inpatients predominantly meeting DSM-IV criteria for schizophrenia (n=350), four fixed aripiprazole injection doses of 1 mg, 5.25 mg, 9.75 mg, and 15 mg were evaluated. At 2 hours post-injection, the 5.25 mg, 9.75 mg, and 15 mg doses were statistically superior to placebo in the PANSS Excited Component and on the CGI-I Scale. • In a second placebo-controlled trial in agitated inpatients predominantly meeting DSM-IV criteria for schizophrenia (n=445), one fixed aripiprazole injection dose of 9.75 mg was evaluated. At 2 hours post-injection, aripiprazole for injection was statistically superior to placebo in the PANSS Excited Component and on the CGI-I Scale. • In a placebo-controlled trial in agitated inpatients meeting DSM-IV criteria for bipolar I disorder (manic or mixed) (n=291), two fixed aripiprazole injection doses of 9.75 mg and 15 mg were evaluated. At 2 hours post-injection, both doses were statistically superior to placebo in the PANSS Excited Component. Store at 25°C (77°F); excursions permitted between 15°C to 30°C (59°F to 86°F) [see USP Controlled Room Temperature]. Opened bottles of ABILIFY Oral Solution can be used for up to 6 months after opening, but not beyond the expiration date on the bottle. The bottle and its contents should be discarded after the expiration date. Store at 25°C (77°F); excursions permitted between 15°C to 30°C (59°F to 86°F) [see USP Controlled Room Temperature]. Protect from light by storing in the original container. Retain in carton until time of use. Patients, their families, and their caregivers should be encouraged to be alert to the emergence of anxiety, agitation, panic attacks, insomnia, irritability, hostility, aggressiveness, impulsivity, akathisia (psychomotor restlessness), hypomania, mania, other unusual changes in behavior, worsening of depression, and suicidal ideation, especially early during antidepressant treatment and when the dose is adjusted up or down. Families and caregivers of patients should be advised to look for the emergence of such symptoms on a day-to-day basis, since changes may be abrupt. Such symptoms should be reported to the patientâ€™s prescriber or health professional, especially if they are severe, abrupt in onset, or were not part of the patientâ€™s presenting symptoms. Symptoms such as these may be associated with an increased risk for suicidal thinking and behavior and indicate a need for very close monitoring and possibly changes in the medication [see WARNINGS AND PRECAUTIONS (5.2)]. Prescribers or other health professionals should inform patients, their families, and their caregivers about the benefits and risks associated with treatment with ABILIFY and should counsel them in its appropriate use. A patient Medication Guide including information about â€œAntidepressant Medicines, Depression and other Serious Mental Illness, and Suicidal Thoughts or Actionsâ€ is available for ABILIFY. The prescriber or health professional should instruct patients, their families, and their caregivers to read the Medication Guide and should assist them in understanding its contents. Patients should be given the opportunity to discuss the contents of the Medication Guide and to obtain answers to any questions they may have. It should be noted that ABILIFY is not approved as a single agent for treatment of depression and has not been evaluated in pediatric major depressive disorder. Read this Medication Guide before you start taking ABILIFY and each time you get a refill. There may be new information. This Medication Guide does not take the place of talking to your healthcare provider about your medical condition or treatment. What is the most important information I should know about ABILIFY? (For other side effects, also see â€œWhat are the possible side effects of ABILIFY?â€). Increased risk of death in elderly patients with dementia-related psychosis: Medicines like ABILIFY can raise the risk of death in elderly people who have lost touch with reality (psychosis) due to confusion and memory loss (dementia). ABILIFY is not approved for the treatment of patients with dementia-related psychosis. schizophrenia in people age 13 years and older. manic or mixed episodes that happen with bipolar I disorder. manic or mixed episodes that happen with bipolar I disorder, when used with the medicine lithium or valproate. long-term treatment of bipolar I disorder. major depressive disorder in adults, as an add-on treatment to an antidepressant medicine when you do not get better with an antidepressant alone. irritability associated with autistic disorder in children and adolescents ages 6 to 17 years old. agitation associated with schizophrenia or bipolar disorder. What should I tell my healthcare provider before taking ABILIFY? breast-feeding or plans to breast-feed. It is not known if ABILIFY will pass into your breast milk. You and your healthcare provider should decide if you will take ABILIFY or breast-feed. You should not do both. phenylketonuria. ABILIFY DISCMELT Orally Disintegrating Tablets contain phenylalanine. ABILIFY and other medicines may affect each other causing possible serious side effects. ABILIFY may affect the way other medicines work, and other medicines may affect how ABILIFY works. Your healthcare provider can tell you if it is safe to take ABILIFY with your other medicines. Do not start or stop any medicines while taking ABILIFY without talking to your healthcare provider first. Know the medicines you take. Keep a list of your medicines to show your healthcare provider and pharmacist when you get a new medicine. Take ABILIFY exactly as your healthcare provider tells you to take it. Do not change the dose or stop taking ABILIFY yourself. ABILIFY tablets should be swallowed whole. If you miss a dose of ABILIFY, take the missed dose as soon as you remember. If it is almost time for the next dose, just skip the missed dose and take your next dose at the regular time. Do not take two doses of ABILIFY at the same time. Do not open the blister until ready to take the DISCMELT tablet. To remove one DISCMELT tablet, open the package and peel back the foil on the blister to expose the tablet. Immediately upon opening the blister, using dry hands, remove the tablet and place the entire ABILIFY DISCMELT Orally Disintegrating Tablet on the tongue. Tablet disintegration occurs rapidly in saliva. It is recommended that ABILIFY DISCMELT be taken without liquid. However, if needed, it can be taken with liquid. Do not attempt to split the DISCMELT tablet. If you take too much ABILIFY, call your healthcare provider or poison control center at 1-800-222-1222 right away, or go to the nearest hospital emergency room. Do not drink alcohol while taking ABILIFY. Also see â€œWhat is the most important information I should know about ABILIFY?â€ at the beginning of this Medication Guide. High blood sugar (hyperglycemia): Increases in blood sugar can happen in some people who take ABILIFY. Extremely high blood sugar can lead to coma or death. If you have diabetes or risk factors for diabetes (such as being overweight or a family history of diabetes), your healthcare provider should check your blood sugar before you start ABILIFY and during therapy. Difficulty swallowing: may lead to aspiration and choking. Tardive dyskinesia: Call your healthcare provider about any movements you cannot control in your face, tongue, or other body parts. These may be signs of a serious condition. Tardive dyskinesia may not go away, even if you stop taking ABILIFY. Tardive dyskinesia may also start after you stop taking ABILIFY. Orthostatic hypotension (decreased blood pressure): lightheadedness or fainting when rising too quickly from a sitting or lying position. These are not all the possible side effects of ABILIFY. For more information, ask your healthcare provider or pharmacist. How should I store ABILIFY? Store ABILIFY at room temperature, between 59°F to 86°F (15°C to 30°C). Opened bottles of ABILIFY Oral Solution can be used for up to 6 months after opening, but not beyond the expiration date on the bottle. Keep ABILIFY and all medicines out of the reach of children. Medicines are sometimes prescribed for purposes other than those listed in a Medication Guide. Do not use ABILIFY for a condition for which it was not prescribed. Do not give ABILIFY to other people, even if they have the same condition. It may harm them. This Medication Guide summarizes the most important information about ABILIFY. If you would like more information, talk with your healthcare provider. You can ask your healthcare provider or pharmacist for information about ABILIFY that was written for healthcare professionals. For more information about ABILIFY visit www.abilify.com. What are the ingredients in ABILIFY? Tablets: cornstarch, hydroxypropyl cellulose, lactose monohydrate, magnesium stearate, and microcrystalline cellulose. Colorants include ferric oxide (yellow or red) and FD&C Blue No. 2 Aluminum Lake. ABILIFY DISCMELT Orally Disintegrating Tablets: acesulfame potassium, aspartame (which contains phenylalanine), calcium silicate, croscarmellose sodium, crospovidone, crème de vanilla (natural and artificial flavors), magnesium stearate, microcrystalline cellulose, silicon dioxide, tartaric acid, and xylitol. Colorants include ferric oxide (yellow or red) and FD&C Blue No. 2 Aluminum Lake. ABILIFY Oral Solution: disodium edetate, fructose (200 mg per mL), glycerin, dl-lactic acid, methylparaben, propylene glycol, propylparaben, sodium hydroxide, sucrose (400 mg per mL), and purified water. The oral solution is flavored with natural orange cream and other natural flavors.